Growing up with excessive underarm sweating, I'm no stranger to the embarrassment of wet marks and stains. I’ve dedicated my career to helping people manage armpit sweat and tried countless natural deodorants and pit pastes to find an effective solution. Recently, I’ve begun experimenting with homemade deodorant recipes. Through trial and error, I’ve learned how to make deodorant that rivals store-bought brands. Why Make Your Own Natural Deodorant? You might resort to homemade deodorants if you’re sensitive to certain ingredients or prefer to use natural, organic products. Everyone has different preferences when it comes to the texture, smell and goal of deodorant. Through this guide, I’ll outline the components that go into an effective natural deodorant recipe, provide ingredient alternatives and walk you through how to make deodorant that works for you. Your deodorant recipe needs a solid to hold the ingredients together. Many organic deodorant brands use natural oils (that are solid at room temperature) to form the base of the deodorant stick or cream. Coconut oil is an ultra-moisturizing ingredient found in many natural deodorants. The oil melts at 77°F, so it’s not ideal for hot climates. Almond oil is used to kill germs and moisturize skin (among other uses). However, it's liquid at room temperature, so when using almond oil as your base, your deodorant must be in liquid form. Next, your deodorant needs a powder to absorb wetness and kill odor-causing bacteria. Incorporating some type of powder in your mixture is essential to making an effective natural deodorant. Unlike antiperspirant, deodorant only works to cover the smell of sweat. A strong, pleasant scent is a must-have ingredient in your natural deodorant recipe to keep your pits smelling fresh. If you prefer a cream deodorant, you can skip this step. But when moving to natural deodorant solutions, some people to prefer the traditional, waxy texture of store-bought deodorant. Beeswax: The natural deodorants I’ve tried that contain beeswax tend to leave a residue on my skin and clothes — even after showering. So be careful when using beeswax. Candelilla wax: Unlike beeswax, natural deodorants that use candelilla wax didn’t leave a residue on my skin and clothing. I would recommend trying this type of wax to avoid stickiness. If you’re looking for rich moisture in your deodorant, adding shea butter or cocoa butter is a smart move. These natural moisturizers leave your skin feeling incredibly soft and nourished. Gather your ingredients: oil for the base, powder, starch, essential oil and wax (if desired). In a mixing bowl, combine your dry ingredients, including the starch and powder. Using the mixer, mix the dry ingredients with your oil base. Optional: Mix in wax to gain a glossy feel. Mix in 20 drops of essential oil. Pour the mixture into a mason jar (if omitting wax) or an empty deodorant stick. Let the solution sit for 1 hour. When switching from chemical-laden deodorants or antiperspirants, you might find that the homemade deodorant doesn't work well. It’s important to know there will be an adjustment period as your body acclimates to the natural solution. It could take up to a week to see the full effects. To speed up this process, you can also do an armpit detox. If you sweat heavily, you know deodorant alone won’t keep you dry. 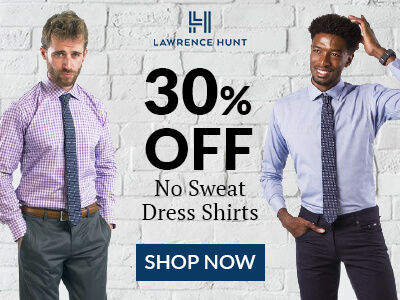 For even more sweat protection, I pair my natural deodorant with a sweat proof undershirt to keep the wetness from showing through my dress shirts and tees. What’s your favorite recipe for making deodorant? Let us know in the comments below!